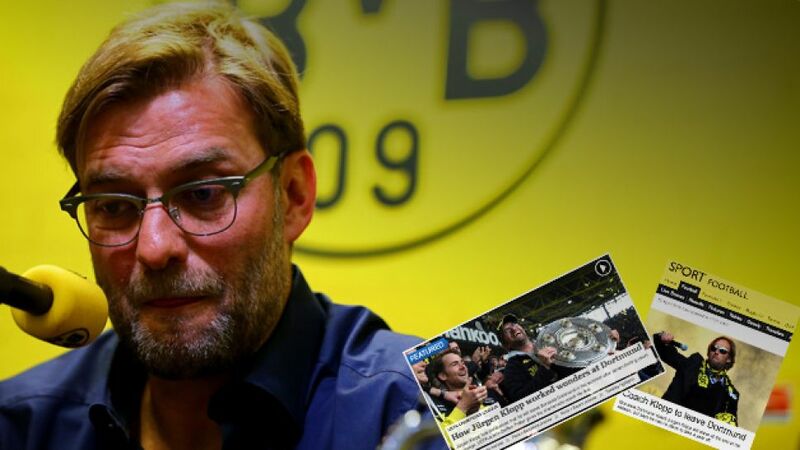 Cologne - Jürgen Klopp kicked off his farewell tour at Borussia Dortmund in style as BVB cruised to a 3-0 victory at home to SC Paderborn 07 on Saturday, while FC Bayern München bounced from their midweek UEFA Champions League defeat with a 2-0 win at TSG 1899 Hoffenheim. Follow all this afternoon's action on the Bundesliga's official English language Twitter account. We've also got coverage of this evening's clash between Wolfsburg and Schalke on Bundesliga radio. We'll be back later with more reaction. BREAKING NEWS: Thomas Tuchel has been confirmed as Jürgen Klopp's successor on a three-year contract. The former Mainz coach will be officially unveiled at the end of the season. Werder have plenty of reasons to be confident going into today's northern derby. Schalke travel to the Volkswagen Arena this afternoon with their Champions League aspirations hanging by the thinnest of threads. to look forward to this afternoon, not to mention another heavyweight clash in Wolfsburg vs. Schalke. Click on the links above for previews of today's two encounters. You can also read yesterday's match reports by clicking on the score of the respective match-up. , but that about does it for our bulletins today. We'll check back in with you on the flip side with two tasty-looking encounters in Bremen-Hamburg and Wolfsburg-Schalke. See you then! 's ankle giving way under a Sebastian Rudy challenge this afternoon. Bernat played on but eventually had to be withdrawn for Jerome Boateng, although the coach confirmed that the Spanish defender should be fit for the Reds' Champions League quarter-final return leg against FC Porto next Tuesday. Bayern, needing to overturn a 3-1 deficit from the first leg, are already without David Alaba, Bastian Schweinsteiger, Franck Ribery, Arjen Robben and Medhi Benatia. at TSG 1899 Hoffenheim and are now just two victories away from a 24th Bundesliga title. over Paderborn and move a step closer to the UEFA Europa League. Don't forget to follow all this afternoon's action on the Bundesliga's official English language Twitter account. We've also got coverage of FC Bayern München's trip to TSG 1899 Hoffenheim live on Bundesliga radio. Enjoy! Imagine these two on the same coaching team! Joselu and Co could use a victory at Leverkusen this afternoon, but the Reds have failed to win a league match since mid-December. Daniel Didavi could make his comeback from injury in Stuttgart's clash with Swabian rivals Augsburg this evening. Lewandowski and Müller are both likely to start today's game against Hoffenheim at the WIRSOL Rhein-Neckar-Arena. Welcome back to bundesliga.com's live updates. Matchday 29 may have got off to a slow start yesterday but fear not, there are six more games to look forward to this afternoon! In the meantime, why not check out the post-match reaction to Gladbach's goalless draw with Frankfurt on the link above? , but for now, we'll bid you adieu until Saturday. Ciao bella. Bayern opened FC Bayern Muenchen LLC - their first office abroad - in New York City on 1 April 2014. Werder are looking to bounce back from last weekend's defeat to Stuttgart when they face HSV on Sunday. Anybody recognise the player taking the penalty? "Tin Jedvaj has had a back problem [...] but if he gets through the final training session unscathed he will be included in the squad. "It's a similar situation with Roberto Hilbert and Bernd [Leno] has suffered a cartilage injury. I can't say for certain that he'll be fit for Saturday." "I want to fight with these players here. And I want to help the injured players. When we lose it's always my responsibility. We lost because of Pep. That's our responsibility. But we are still strong with these players. "Philipp [Lahm] has a stomach virus and won't be fit, and Franck [Ribery] has a twisted ankle. [Bastian] Schweinsteiger has been in bed for the last eight days with a bug. I don't think he'll make it." Bayern's Moroccan centre-back turns 28 today! The third best attack in the division against a side that have beaten FC Bayern and Dortmund in their last two matches. Not a bad way to kick-off the weekend, I'm sure you'll agree! And it's with those words of optimism that we round off our first dose of Matchday 29 updates. Don't forget to join us again tomorrow when we'll continue to bring you all the build-up to another massive weekend in the Bundesliga. Until then, why not have a read of our Eintracht Frankfurt - Borussia Mönchengladbach preview? It should be a cracker. Catch you tomorrow! Sebastian Rode has taken to Twitter to share Bayern's plan of action following last night's 3-1 first-leg defeat to Porto in the quarter-finals of the Champions League: "Dust ourselves down and go again! Next week we'll be able to set the record straight and turn it around together!" Eintracht Frankfurt forward Haris Seferovic told journalists at today's pre-match press conference that the loss of 19-goal leading scorer Alex Meier for the rest of the season to injury is "a real shame. We'll try to share the load." The Eagles host Borussia Mönchengladbach on Friday night looking for their first win in four. Royal Blues gems Max Meyer (l.) and Leroy Sane (r.) were able to take it easy after today's training session. Schalke will be up against Wolfsburg on Sunday evening in Matchday 29's concluding encounter. "It's difficult to find another [club] in European football that has a stadium, fans and a team like Gladbach," says Oscar Wendt. Warm words indeed from the Swedish left-back. The FC Bayern squad have landed back in Munich. Next stop: Sinsheim! "We're without Sahin, Kirch, Piszczek, Kehl and Subotic. Subotic has a back problem and Kehl broke a rib yesterday. Reus, Kuba, Bender, Durm and Großkreutz haven't been able to train today. "I have seen how the players have reacted [to my departure] on social networks." Hoffenheim head coach Markus Gisdol has extended his contract with the Sinsheim-based club until 2018. FC Bayern are flying home after yesterday's 3-1 defeat to Porto in the first leg of the UEFA Champions League quarter-finals. "We will make a decision and tell the players on Sunday who will play. Everyone has a chance to prove themselves. Wolf and Sternberg will be playing on Sunday. "Some of these players haven't experienced this derby with Werder. We've been telling them about 2009 [when Bremen beat Hamburg on away goals in the UEFA Cup semi-final." "He always wanted me to send in crosses for him after training, even though I wanted to go home."